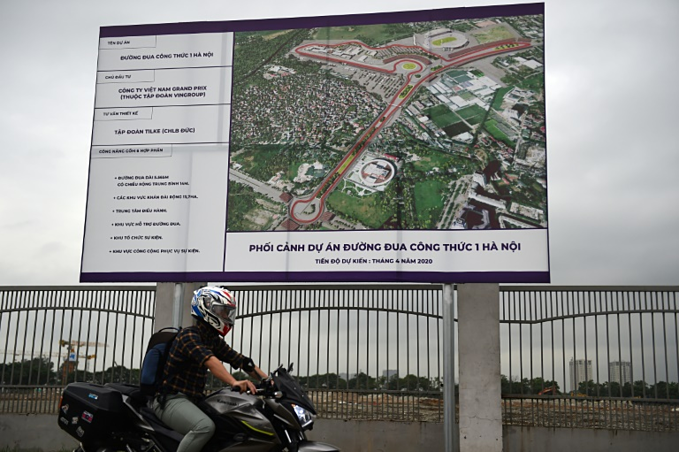 Carey was speaking Monday after inspecting initial work on the 5.6 kilometer (3.5 mile) track that will combine existing roads with newly-built routes in the Vietnamesecapital, which is hosting its first F1 race from April 2020. “We think this track can really be a special race that provides some uniquely exciting racing and competition,” he told reporters. “It’s the combination of a city race — we’re in the city centre — a street race which always has some special elements to it, and a track that I think we’ve really had the opportunity to work (on) from day one,” said Carey. The course has been designed “in a way that we think can deliver some special racing for fans,” he added. The track is around Hanoi’s My Dinh stadium, about 13 kilometers from the city center after it was deemed too expensive to hold the race in the city’s famed Old Quarter. Carey compared plans for the Hanoi track to Britain’s Silverstone and Spa-Francorchamps in Belgium, which he called “historic” sites. Carey said he was happy with Hanoi’s pre-race progress so far but warned organisers to keep at it. The Marina Bay Sands street track night race in Singapore remains F1’s crown jewel in Asia, with the city state’s Grand Prix drawing 263,000 fans last year. Vietnam — where racing is a marginal sport — is hoping to avoid those pitfalls. Instead the country’s largest privately-owned conglomerate VinGroup is the main financial backer. Carey hopes Vietnam will adopt a winning formula to ensure it doesn’t go the way of past flops. “It’s got to have all the elements that creates the race at the centre, creates that excitement, and that energy and that breadth of activities that really enables it to be the spectacle we want it to be,” he said.